Tubing in Vang Vieng was the driving force behind my visit to Laos. It turned out to be as good a reason as any, and I was glad to make it to the little backpacker haven for my 32nd birthday as well. I celebrated with rock climbing by day, and Korean BBQ and beers by night. Then it was on to Luang Prabang, and a little culture (ie. more temples), before I jetted over the border to northern Thailand. I thought they were picturesque too, though at the risk of shattering one's image and impressions from the photo alone, the one guy closer to me did ask for a donation while I was up there (on a hill/park overlooking Luang Prabang). Really nice picture! 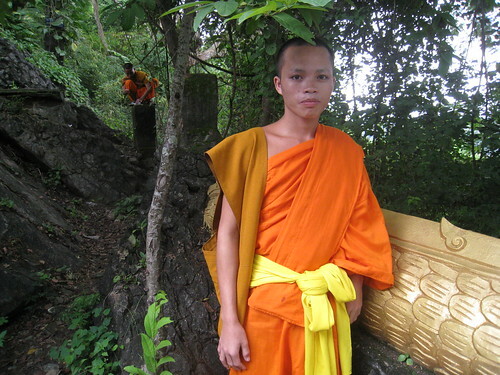 It took me a while to realize that there was another monk in the background standing on a tree trunk.